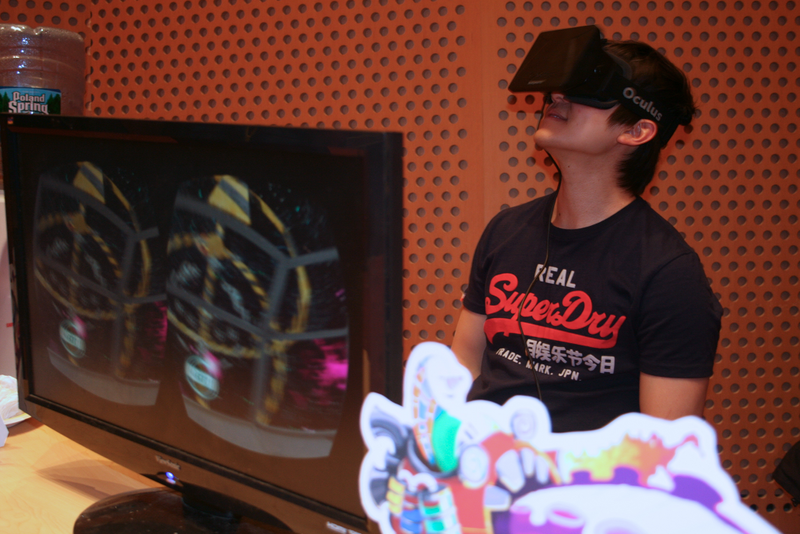 We were really lucky to have an incredible breadth of games and projects available – Defective Games were there showing Gimbal Cop with an Oculus Rift (our local organiser Chong-U is showing us how it works in the photo above) while just over the other side of the room we had Andrew Plotkin demonstrating his latest Wiki-MUD-like project Seltani. The Interactive Narrative Workshop attendees turned up to entertain everyone with their various narrative-styled boardgames (including a tense game of The Resistance). Meanwhile Jesse from Proletariat Games worked the floor showing off World Zombination on an iPad – huge amount of exciting stuff going on with that studio. Synthesis somewhat stole the show for me – a really curious pitch with some incredibly rich mechanics hiding just under the surface. Thanks to Chris for driving hundreds of miles to come demonstrate for us! I also want to thank our research demonstrators who put on a great show for the science side of things: Peter, Daniel and Ed from the University of York showed off their latest MCTS work on boardgame AI, and teamed up with Jeff from the AI Factory to let us take a look at Spades, which also featured in their talk at the main conference! Pedro Nogueira demo’ed the incredibly affecting Vanish, a procedural horror game that should be featuring on The Saturday Papers soon. And last but by no means ever least, Mike Treanor was showing everyone Prom Week and the Game-o-Matic, to great effect (Mike’s presentation in the main conference was also incredibly entertaining). I got great feedback from demonstrators and attendees – thank you all so much for coming and making it a great event! I’m hoping to bring a similar format to London very soon, hopefully with room for members of the public to come and say hello too. Stay tuned for more details on that. Finally, a big thanks again to Chong-U for organising the event on the Boston side – without him this never would have happened! The pictures turn out to be great! Thanks Jonathan! And thanks for coming along to the event, too.